Take the Skin Conditions Quiz First! Before reading this FAQ, challenge yourself and Test your Knowledge! What skin condition causes localized red, itchy blisters that ooze then crust over? 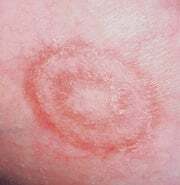 Ringworm is a fungal infection caused by worms. True or False? A noncontagious rash of thick plaques and scales describes what skin condition? What is the name of the chronic skin disease with acne-like features that affects the middle portion of the face with persistent oily redness? Which intensely itchy skin condition is caused by what has come to be known as the "itch mite"? The human papillomavirus (HPV) causes the skin condition known as what? Itching, burning, pain, and scaling caused by a fungus of the feet describes what? Small flaps that hang off the skin are called skin tags. True or False? Excessive exposure to sunlight is the main cause of what skin condition? Insecticidal medication and the use of a specific comb is the treatment for what? Brownish or tan pigmentation of the face during pregnancy is called what? What is the most dangerous form of skin cancer? Q:What skin condition causes localized red, itchy blisters that ooze then crust over? A:Shingles. Shingles, also known as herpes zoster, is a cutaneous recurrence of a latent viral (in spinal or cranial nerve ganglia) infection caused by the varicella-zoster or chickenpox virus. It appears as multiple vesicles in the cutaneous distribution of a sensory nerve, a dermatomal distribution. In older individuals, it can be intensely painful, producing a chronic postherpetic neuralgia syndrome. Q:Ringworm is a fungal infection caused by worms. True or False? A:False. Ringworm is caused by certain mold-like fungi on the surface of the skin. Lesions are most often well circumscribed and round. 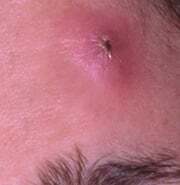 The border of the lesion may be scaly or have small blisters. Lesions are often quite itchy. The diagnosis is easily confirmed by visualization of fungal elements in the skin scales after exposure to potassium hydroxide under the light microscope. Q:A noncontagious rash of thick plaques and scales describes what skin condition? A:Psoriasis. 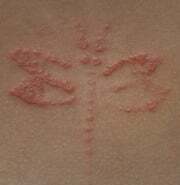 Psoriasis characteristically appears as elevated plaques of red scaling itching skin on the scalp, elbows, and knees. Its presence aside from its unpleasant appearance signals a systemic form of inflammation that can produce a destructive form of arthritis along with premature coronary vascular disease. Q:What is the name of the chronic skin disease with acne-like features that affects the middle portion of the face with persistent oily redness? A:Rosacea. 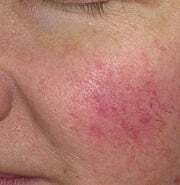 Rosacea is an inflammatory condition most often characterized by pustules, papules, and redness affecting the face. The papules and pustules respond to the anti-inflammatory effect of certain antibiotics. Some patients with rosacea note an increase in the size of their nose along with an unsightly change in shape. A:A boil is an acute abscess most often produced by a bacteria like Staphylococcus aureus. 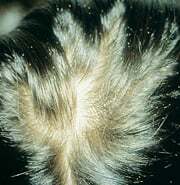 It probably begins as an infection of a hair follicle and then progresses to a furuncle and then an abscess. Aside from taking an appropriate antibiotic, the abscess will resolve rapidly if it is incised and drained to allow the release of pus. It appears as a rapidly enlarging, tender, red fluid-filled mass that is exquisitely painful. Q:Which intensely itchy skin condition is caused by what has come to be known as the "itch mite"? A:Scabies. 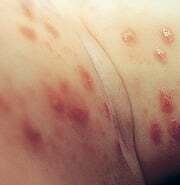 Scabies is an infestation produced by a mite, Sarcoptes scabiei, which seems to have a unique predisposition to infect only human skin. After an incubation period of about three weeks, the patient develops an allergic contact dermatitis to the mite and forms very itchy red vesicles that seem to be most common in the webs of the fingers and in the groin. People often acquire the infection during sexual activity or in nursing homes. Q:The human papillomavirus (HPV) causes the skin condition known as what? A:Plantar warts. Plantar warts are benign tumors on the sole of the foot. The human papillomavirus (HPV) causes plantar warts. They usually appear as thickened callus-like lesions with small black dots visible in their depths. If the wart is present in a weight-bearing site, like the ball of the foot or heel, they can produce significant pain. Paring the thickened skin down to the normal thickness may relieve the pain. The appearance of these warts is quite different from those on the hands, which may be due to that fact that plantar warts form on a weight-bearing surface. Q:Itching, burning, pain, and scaling caused by a fungus of the feet describes what? A:Athlete's foot. Athlete's foot is a nonspecific term given to an itchy, chronic dermatitis affecting the feet. A fungal infection often causes athlete's foot, but it may also be a manifestation of a variety of other conditions. If it is caused by a fungus, tinea pedis is an appropriate designation. The fungal nature of the eruption can be confirmed by examining a potassium hydroxide mount of scale or skin obtained from the affected skin. Q:Small flaps that hang off the skin are called skin tags. True or False? A:True. A skin tag (acrochordon) is a fleshy polyp composed of skin, fibrous tissue, and blood vessels. It is characteristically found on the neck, armpit, and inguinal (groin) creases of most adult humans at one time or another. When the blood supply at the base of the polyp becomes compromised, there may be pain associated with the tag as it dies. There is no particular medical reason to destroy these, but this is easily accomplished by freezing the skin tag with liquid nitrogen. On the other hand, patients have been known to tie a piece of thread around the base of the tag to shut off its blood supply. Q:Excessive exposure to sunlight is the main cause of what skin condition? A:Excessive exposure to sunlight is the main cause of skin cancer. SThe three most common forms of skin cancers are basal cell carcinoma, squamous cell carcinoma, and malignant melanoma. Most cases of these three cancers are induced by mutations caused by ultraviolet light exposure although there are a few cases of skin cancers that are inherited. They typically appear on sun-exposed surfaces. 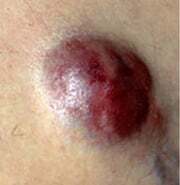 Basal cell carcinomas are pearly, reflective lesions that bleed easily. Squamous cell carcinomas are keratotic nodules. Malignant melanomas are asymmetrical, irregularly shaped pigmented tumors. Pathological examination is required for diagnosis. Q:What causes Rocky Mountain spotted fever? A: Rocky Mountain spotted fever is a bacterial disease caused by R. rickettsii, which is transmitted, to humans by the bite of a hard-shelled tick. Infected patients have a high fever, a severe headache and a rash composed of fine red spots on the arms and legs. There may be no history of a tick bite. The mortality rate can be quite high unless the patient is treated with doxycycline. Q:Insecticidal medication and the use of a specific comb is the treatment for what? A:Insecticidal medication and the use of a specific comb is the treatment for head lice. Q:What is allergic contact dermatitis? A:Allergic contact dermatitis is a delayed hypersensitivity reaction. The dermatitis is weepy and oozing in a distribution localized to the skin that was exposed to the allergen. The identity of the allergen can be determined through patch testing, which is a localized exposure of a known concentration of the presumed allergen under occlusion for 48 hours. Paraphenylenediamine is a dye substance used to enhance the appearance of temporary tattoos, which are known to be allergenic. This type of reaction reflects a specific sensitivity or allergy to a specific substance. It's also called allergic contact eczema. Q:Brownish or tan pigmentation of the face during pregnancy is called what? A:Melasma. 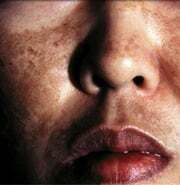 Melasma is due to the abnormal deposition of melanin pigment in facial skin. It is most common in females on the forehead, malar cheeks, upper lip, and chin. It seems to be associated with pregnancy and oral contraceptives. It is believed that light plays a role in its appearance. Treatment may require the application of a topical bleaching cream containing hydroquinone, tretinoin, or azelaic acid. Occasionally, certain laser treatments may be of benefit. Q:What is the most dangerous form of skin cancer? A:Melanoma is the most dangerous form of skin cancer.